KUALA LUMPUR: The imposition of the real property gains tax (RPGT) may be reconsidered once the Government receives feedback from all parties, including non-government organisations, says Deputy International Trade and Industry Minister Datuk Mukhriz Mahathir. “We will keep monitoring to see if the measures have good effect or not. We will look at the feedback and if there is a need for us to do any adjustments, we will reconsider,” he told reporters yesterday after the seminar on The Fundamentals of Globalisation & Liberalisation – Its Impact to the Real Estate Industry. Mukhriz also said the Transport Ministry would come up with a road map regarding the Government’s measures under the recently-reviewed National Automotive Policy (NAP) that introduced an annual comprehensive inspection as requirement for road tax renewal for vehicles aged 15 years or older. “People need not worry about this new policy as it is for their own good and safety. “Plus, it will not start on Jan 1 next year and the timeframe to impose the policy will be up to the Transport Ministry after collecting all the necessary feedback,” he said. Under the reviewed NAP, he said the ministry was encouraging Proton Holdings Bhd to enhance competitiveness through strategic partnerships and it was up to the national car manufacturer to make the decision. “For this matter, we are encouraging it to find a partner that can give it technical expertise,” he said. Meanwhile, Raine & Horne International Zaki and Partners managing partner Datuk Zaki Said said the imposition of the RPGT next year would make investors feel uncomfortable with the local property market as the policy was inconsistent. “Nevertheless, we think this measure is to curb speculative buying and will not give much impact to the overall property market performance,” he said, adding that the RPGT was also one way for the people to participate in building up the economy as it would help the Government gain more revenue. PETALING JAYA: Financial institutions, in particular banks, have in general agreed to raise mortgage lending yields, which will have an impact of increasing their net interest margins (NIMs). An analyst with OSK Research said banks with strong mortgage lending growth would be the key beneficiaries, while the eventual increase in benchmark interest rates would benefit all banks on a greater scale as loan assets tended to re-price faster than deposits. He said higher home loan rates were imminent and expected housing loan rates to trend upwards in the not-so-distant future as the banking industry moved towards risk-based pricing in determining more sustainable interest rates for the industry. The upswing in home loan rates is inevitable as economic conditions improve. “The pricing war among banks earlier this year had brought housing loan interest rates to a level that was below or near the cost of funds and was not sustainable. With early signs of economic recovery, the rates are bound to increase,” he noted. The average lending rate (ALR) rose to 4.91% in September from 4.9% in August. 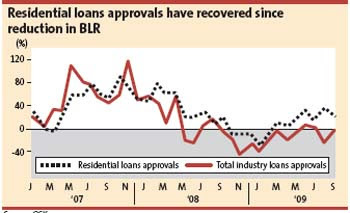 The current average base lending rate (BLR) is 5.51%. With home loan rates improving, OSK Research has maintained an “overweight” call on the banking sector. “We are maintaining an ‘overweight’ call on the sector on the grounds that non-performing loans are likely to be benign. “Meanwhile, the downtrend in provisions and strong capitalisation positions should provide future earnings and capital management upside surprises, which may not be fully reflected in banks’ valuations,” he said. The analyst said the banking sector was currently trading at a mid-cycle price-to-book value of 1.68 times. An analyst with HwangDBS Vickers Research also said mortgage rates needed to be increased to remove irrational price competition. “Rate hikes are positive for banks,” he said, adding that for now, the price change would mainly affect the secondary property market, leaving the primary market unscathed. “Pricing power depends on banks’ cost structure and incidences of default. We believe banks will price products based on risk,” he said, adding that margins were now extremely thin. The analyst said banks were barely breaking even with irrational competitive pricing for mortgage products. “At BLR minus 2.4%, it effectively takes banks at least two to three years to break even. The BLR now stands at 5.55%, while average cost of funds for banks was about 2%. “Taking into account implied costs set aside for credit default ranging from 20 basis points (bps) to 30bps, coupled with overhead costs (agent’s commission and fees) another 30bps, net yield gain on a mortgage loan was merely 1%. “Rate levels are already at an all-time low. We believe it is a matter of time before rates pick up,” he noted. The HwangDBS analyst said pricing power was within the perogative of the individual banks. “Every bank will price products based on their respective cost structure and also incidences of default. “While we agree that mortgage pricing has reached a level of irrationality, we believe banks will price products based on risk,” he said. On the evolving banking landscape, the analyst said the overnight policy rate was anticipated to rise in the third quarter of 2010. This is in line with the stronger-than-expected growth (HwangDBS forecast of 5% versus official forecast of just 2% to 3%) as well as inflation trending toward 2.3% to 2.5% by July 2010. “We are looking at 25bps in the third quarter 2010 and another 25bps in the fourth quarter. With the re-pricing of loans quicker than deposits, the impact would generally be positive on NIM,” he said. The analyst said banks with positive impact on rate hikes were Hong Leong Bank Bhd and RHB Capital Bhd by virtue of their higher proportion of variable rate loans. However, he said, Public Bank Bhd’s mortgage loan volumes might dwindle but the reseach house expected higher rates should more than neutralise this impact. However, with banks standardising mortgage rates and eliminating zero-entry cost packages for secondary market transactions, it will dent sentiment. The analyst said the banks had agreed to end the mortgage price war. “We understand some banks have started to raise mortgage rates for new applications since this week. The government may do away with the real property gains tax (RPGT) based on feedback from industry players, said Deputy International Trade and Industry Minister Datuk Mukhriz Mahathir. The RPGT will return next year at a fixed 5 per cent after it was scrapped in 2007, following the 2010 Budget announcement on October 23. However, some industry players were upset about the tax as they feel it could hurt the market and Malaysia's effort to promote local properties to foreigners. "We will look at the feedback and if there is a need for us to do any adjustments, we will reconsider," he said in response to media queries. Mukhriz was launching a one-day seminar on the impact of globalisation and liberalisation to the business and real estate industry. Mukhriz said the government had received feedback from non-governmental organisations and other agencies. Earlier, he said the government had provided numerous incentives to the housing sector to shore up the economy as shown in the RM400 million incentives extended through the two stimulus packages. In addition, there is a tax relief on housing loan interest of up to RM10,000 for three years in the 2009 Budget to stimulate the industry. Meanwhile, estate agent Raine & Horne managing partner Datuk Zaki Said said the property sector does not take policy inconsistencies well. "The international market feels uncomfortable with changes in the policy. On the part of the industry and policymakers, they are looking at the (market) scenario one of which is to curb speculation." "But we need genuine buyers which will be good for the industry and economy," he said. The Malaysian property market has been attracting regional buyers, including Singaporeans and there has been higher interest for expensive properties in Kuala Lumpur from Indonesian investors too. Zaki said the market has stabilised and is expected to grow by 5 per cent to 10 per cent next year. The banking industry should consider having standard documents for housing loans after some banks have started to raise effective lending rates for new home buyers. Currently, the forms differ from bank to bank and a uniform application would benefit consumers, said National Housing Buyer Association (NHBA) honorary secretary-general Chang Kim Loong. A standard loan documentation would mean that house buyers will know the contents of the documents before even thinking of buying a house. "With a standard loan document, consumers don't have to go through the bane of reading and understanding the forms before signing the document as everything is standard... they just need to print it out. "I urge Bank Negara to look into this to protect the house buyers," he told Business Times yesterday. Checks with the country's nine commercial banks revealed that all of them will raise their mortgage rates for new borrowers. This will be around Base Lending Rate (5.55 per cent) minus 1.8 per cent from BLR minus 2-2.3 per cent. "The only thing that would differentiate one bank from another now is the service that the bank renders," said one banker who did not want to be identified. Net interbank lenders and banks with high exposure to mortgage loans like Public Bank, Alliance Bank and Hong Leong Bank will be the biggest beneficiaries of revision in mortgage rates, analysts say. OSK Research Sdn Bhd analyst Keith Wee said in a report yesterday that banks generally have agreed to raise mortgage rates to BLR (Base Lending Rate) minus 1.5 per cent to -1.9 per cent. This was from BLR -2.0 to -2.3 per cent before. Investors welcomed the news yesterday, pushing banking stocks up. Public Bank's warrants saw the most gain by adding 22 sen to close at RM10.92, while RHB Bank's shares followed with a 21 sen increase. Hong Leong Bank rose 17 sen to end at RM7.90, while Malaysia's largest bank, Maybank, closed 10 sen higher at RM6.82 for the day. The net impact of the move will be positive as the higher profit margin will more than offset the potential impact of marginally slower loans growth. "We estimate that the upward revision in mortgage yields would contribute to an 8 to 10 basis points (bps) enhancement in industry net interest margins," Wee said in his report. Public Bank, which has the strongest mortgage loans growth, will be a key winner with an estimated 3 to 4 per cent enhancement on its financial year 2010 earnings. The report also said that most banks will no longer absorb the legal fees on loan documentation, which make up about 1 to 2 per cent of loan value, offered earlier. ECM Libra Investment Research head Ching Weng Jin said while banks will definitely benefit from the BLR raise, mortgage sales are unlikely to be affected. "It is more of a defensive move by the banks, rates are still cheap at minus 1 (per cent) and I don't think it will affect mortgage sales," he said. Macquarie Equities Research in a report on the banking sector yesterday said lending rates will stay low until the second half of 2010 due to mild loan growth. "This has partly driven down pricing, particularly on housing loans. Even if there is a return to rational pricing, we do not anticipate a significant improvement in margins for the banks," Macquarie said. JOHOR BARU: Property developers in Johor can look forward to better days ahead after almost a year of slow sales due to to the economic recession, as the sector is beginning to see early signs of recovery in the state, said Real Estate and Housing Developers Association (Rehda) Johor branch chairman Lee Kim Chai. Our members are hoping to record better sales this time, aroun d RM150mil or more within a month... REHDA JOHOR BRANCH CHAIRMAN LEE KIM CHAI. “Our members reported slightly better sales in the second and the third quarters of the year and expect the momentum to continue until this last quarter,” he told StarBiz recently. “Iskandar Malaysia, which is already in its third year, will be the main driving factor that will help push up demand for properties in south Johor,” he said. Lee noted that in the last Malaysia Property Expo (Mapex) held in Johor in April, the 31 developers who took part in the four-day event had raked in RM120mil in sales over a one-month period. The current Mapex Johor, which starts today and ends on Sunday, will be held for the first time at the Persada Johor International Convention Centre. The 33 participating developers are offering 8,000 completed units with certificates of fitness in the four-day event, with over RM1.8bil worth of properties up for sale. “Our members are hoping to record better sales this time, around RM150mil or more within a month,” Lee said, adding that developers should learn from the lessons of the economic downturn, such as to offer better products and not to overbuild. There will also be two property talks on Sunday by Kuala Lumpur-based property consultant Ho Chin Soon. PETALING JAYA: Berjaya Land Bhd (BLand) will start development work on its US$6.3bil (RM21.8bil) integrated propery development project in Dong Nai province in Vietnam in 2012, the company told Bursa Malaysia yesterday. The Nhon Trach New City (NTNC) township project was scheduled for completion in stages from 2015 to 2030. “The estimated investment cost is US$400mil (RM1.4bil),” BLand said. The NTNC would be developed and managed by Berjaya NTNC Ltd, a newly incorporated company of BLand’s wholly owned subsidiary Berjaya Leisure (Cayman) Ltd (BL Cayman). BL Cayman had received the investment certificate from the Vietnamese licensing authority for the NTNC project. The NTNC project is located on 600ha in the heart of Nhon Trach City and is about 30km from Ho Chi Minh City. The planned integrated township would comprise of administration, healthcare, educational, cultural and art centres, mixed residential and commercial projects. The gross development value was estimated at US$6.3bil, while the cost was projected at US$4.9bil (RM17bil). BERJAYA Land Bhd will start to develop its US$6.3 billion (RM21.55 billion) 600ha Nhon Trach New City mixed development project in Dong Nai Province, Vietnam, in 2012. Its wholly-owned subsidiary, Berjaya Leisure (Cayman) Ltd has received the investment certificate from the licensing authority in Vietnam for the project, Berjaya Land said in a filing to Bursa Malaysia yesterday. The project will be developed in stages until 2030 and managed by Berjaya Leisure's unit, Berjaya Nhon Trach New City Center. Can I be the only person who finds the whole topic of global warming to be incredibly boring? I try to avoid reading newspaper articles on the subject, which to me, is just as mind numbing as American politics, trouble in Northern Ireland or football. My ideal newspaper would devote the front page to humiliating drivers who turn left without signalling. Then I’d like to see a daily two-page spread on the public flogging of taxi drivers who don’t use their meters, and 15 pages of business news followed by three pages of Dilbert. Advertisements for water filters and groceries would be actively discouraged. In fact, I’d have every advertisement vetted by the principal of Victoria Institute or St Johns or any similar establishment that still valued grammar. The newsprint would have to be soft of course because I would want to recycle it by ermm... feeding it to my hamster. According to a recent book Time to Eat Your Dog; the Real Guide to Sustainable Living, two hamsters have the carbon footprint of a plasma TV. Arguably, even one hamster has more entertainment value than Malaysian TV, but this may not be a popular opinion. I happen to like warm weather and refuse to be spooked by global warming until polar ice melt is lapping round my ankles and the wife and hamster have fled to the safety of Genting Highlands. Nevertheless, even I was happy to see that Budget 2010 was the first to give priority to the procurement of goods and services that are environment-friendly. The same budget announced a fund of no less than RM1.5bil to be given as soft loans to companies that supply and utilise green technology. The development industry has responded rapidly to the call for more environmental-friendly buildings. New residential condominiums to be certified include Ken Bangsar, Sunway Palazzio and Sunway Challis Damansara. 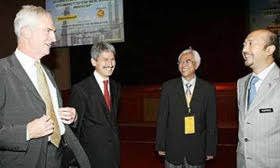 In the commercial arena, the new Malaysian headquarters of Shell, 348 Sentral, will also be certified when completed in 2012. Perhaps the biggest news this year is the completion and launch of Malaysia’s own Green Building Index (GBI), modelled on those developed internationally such as LEED (Leadership in Energy and Environmental Design) and BREEAM (Building Research Establishment Environmental Assesment Method). The product of collaboration between Malaysia’s architectural and engineering professions, the GBI has been customised for local use and will undoubtedly become the certification of choice for the industry. My personal view is that it is extremely comprehensive but could possibly have benefited from consultation with a wider spectrum of professionals in the industry. For example, while points are awarded for not building on wetlands or virgin forest, the demolition and redevelopment of buildings and sites with heritage value is apparently quite acceptable, because there is no mention of them. I would also argue with the points awarded for not providing in excess of the legal minimum number of car parking spaces. Many buildings, especially retail complexes, provide in excess of the minimum because shoppers want them. Providing the bare minimum can create inconvenience to users, and also hasten obsolescence which in turn leads to a waste of resources. However, in my opinion the biggest omission of the BGI is in the area of design efficiency. The development industry pays great attention to the ratio of gross building area to net usable space. The ratio achieved in a building reflects the skill of the architect. This is not an attempt to stinge on facilities, but to deliver the same building at a lower cost. A building may require 180,000 sq ft of gross area to provide 100,000 sq ft of usable space, while another design may require only 140,000 sq ft. The BGI has copious provision for heat insulation and power consumption factors and all the rest. But inefficiency of design can lead to massive wastage of materials, higher operating costs, and under-utilisation of resources. One of the three key elements of sustainability is after all, viability, which is always enhanced by an efficient design. Would anyone in the architectural profession care to comment? Christopher Boyd is executive chairman of Regroup Associates Sdn Bhd.